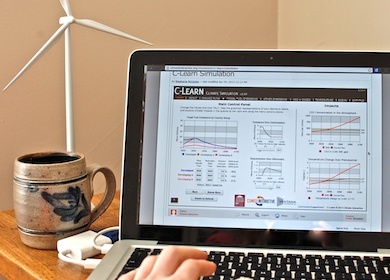 We are pleased to announce the launch of a new version of the C-Learn simulation for the web. C-Learn enables you to explore the level of emission reductions it will take to address climate change across three different groups of countries. This updated version is built on a new platform, so those familiar with the old version of C-Learn will notice slight changes to the interface. The Forio Simulate platform that we have switched to allows you to embed the simulation on an existing website and create a free account to save your scenarios for later. We’ve also improved the ability to use C-Learn for running the World Climate Exercise and added a new feature that calculates how annual emission reductions equate to the percent change above or below 2005 levels of CO2 in 2050. Check out the new version of C-Learn.